Including rose bushes into your landscaping or garden can create a wonderful visual centerpiece. Rose bushes offer attractive foliage and spectacular blooms. As such, they are some of the most popular flowering plants cultivated by gardeners. However, caring for rose bushes can be tricky, especially if you have never done it before. To keep a rose bush as healthy and spectacular as possible, you must give it proper drainage, the right amount of sunlight, the correct amount of water, a good fertilizer, and thorough summer prunings. The soil around a rose bush should drain fairly easily. Roses do not react well when conditions are too wet, especially for a long period of time. As such, the soil in which you plant the rose bush should be something which will drain easily. If the soil in your area is heavy in clay, you may want to consider replacing that soil with a lighter, more drainage friendly soil mixture. Otherwise, simply tilling the soil well before planting will allow for good drainage. If possible, plant the rose bush in a spot from which water will tend to flow away. Planting roses at the bottom of an incline is also not advisable for this reason. Roses need a good deal of sunlight in order to thrive. Ideally, the spot will receive 6 hours or more of sunlight on a daily basis. Some varieties of roses will do well in somewhat shadier conditions, but most will do best in full sunlight. In order to maintain this, it may be necessary to pick a spot away from any large trees. As with any plant, correct watering is critical to the health of rose bushes. A good general rule of thumb is to ensure that the rose bushes receive 1 inch or more of water per week during their active growing season. During most of the growing season, seasonal rains will likely provide much of the needed water. During drier weeks, however, the rose bushes will still need to be watered diligently. It is usually best to water directly into the soil, as roses are particularly vulnerable to fungal diseases. For this reason, maintaining proper watering can be a delicate balancing act with making sure that the water drains away quickly and does not sit on the roots of the roses. Roses are not quite so simple as some other plants when it comes to fertilization. Generally speaking, roses do well with organic fertilizers, which both feed the plant and help to improve the soil around it. However, organic fertilizers will only feed the plant. Some chemical fertilizers, on the other hand, include compounds that will also protect the plant from fungal diseases and insects. 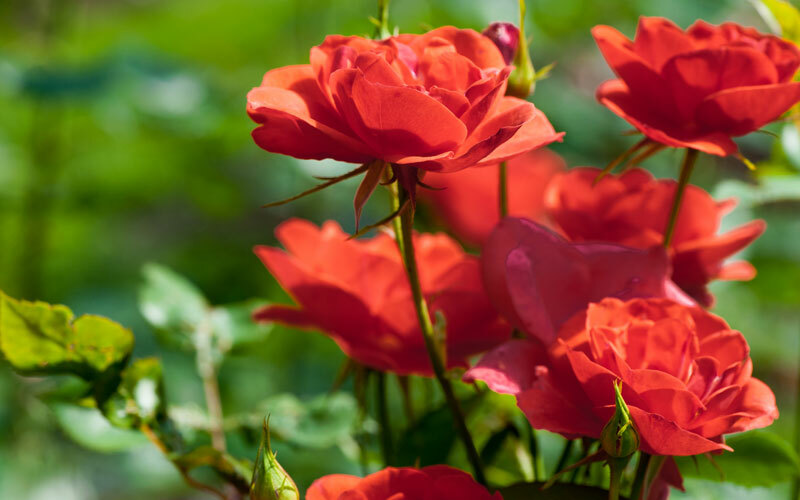 These chemical compounds will do little to help the soil around the roses, so it is usually a good idea to periodically add organic material to the soil when using them. A fertilizer with a well balanced NPK rating will generally be the best for roses. Roses also tend to do best when one fertilizing chemical is not used for too long, because of the potential buildup of chemical compounds in the soil. As such, it can be a good idea to rotate fertilizers to prevent such buildups. This is not necessary when using only organic fertilizers. Summer pruning, also known as deadheading, is a simple technique that can be employed to enhance the blooming of a rose bush in the summertime. While this has no direct effect on the overall health of the rose bush, it is still useful to know for general rose care. Deadheading is quite simply the act of cutting away dead or dying blooms on the bush. Fresh, healthy blooms should of course be left alone. Deadheading will force the plant to continue blooming, thus enhancing its visual appeal and lengthening the part of the growing season in which flowers can be seen. Deadheading is commonly employed on both mature and starting rose bushes, and will have no ill effects on the health of the plant. As anyone who has experience in caring for rose bushes will tell you, keeping roses in optimal health is not as easy as it may seem. Their needs are very specific, and conditions must be closely controlled in order to meet them. Proper light and watering, good drainage, and a good fertilizer will get your roses off to a good start. As with all plants, the first year is generally the hardest for roses. Once established, they become somewhat more hardy, although they will still be vulnerable to fungal diseases caused by sitting water. However, there is nothing more beautiful or satisfying to the gardener than a healthy rose bush in full bloom, so you may be sure that the result will be well worth your efforts.